Minimize Distractions Get Going With Warmups Organize Your Time Go For It! Whether you're going to work out in a gym or at home, you should prepare for each session with a few fundamentals to ensure your experience is as useful, safe and enjoyable as possible. No need to panic, though; after a few sessions most things will fall into place, and if you attend a gym, never be afraid to ask an instructor how something works or for help improving your form when exercising so that you can be certain you are doing the exercise safely and for the best result. Follow up with these instructional articles on how to perform common weight training exercises. Do You Need a Medical Check-up? 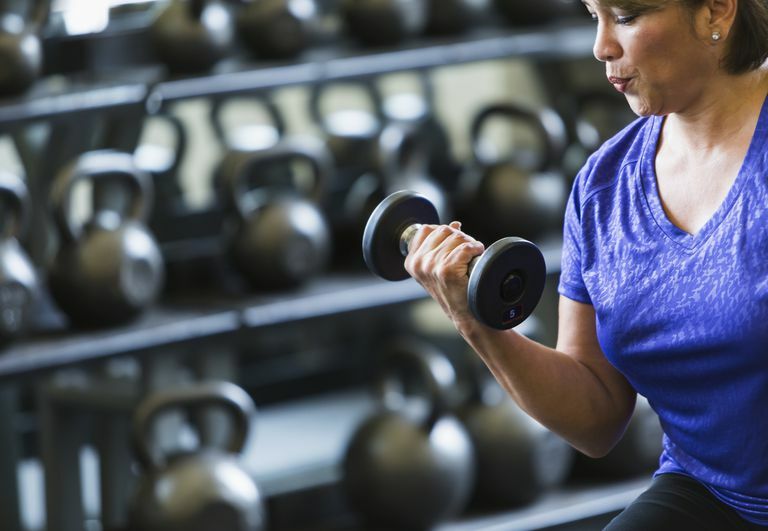 If you haven't exercised for some time, are an older person, or have a chronic illness, you should ask your doctor if it's okay for you to do weightlifting, or indeed any form of moderate to hard exercise. Personal trainers, gyms and health clubs will usually screen you, or at least get a waiver from you before they grant membership or take you on as a client. In any case, it makes sense for you to be as sure as possible that your planned activity safely matches your health status and capabilities. Conditions, such as Type 1 and Type 2 diabetes may require additional input from dietitians prior to an exercise program. You don't have to go out and buy the most expensive gear you can find. You can if you like, but functionality is the prime consideration. You need good solid shoes with non-slip soles. Running shoes are okay, particularly if you intend to do some work on the treadmill, stepping machine, and cross training machines. Cross training shoes are better, and if you get into competition weightlifting, a specialist pair of lifting shoes will do the trick. Don't use anything too high in the heel. For weights, you need a good solid foundation where you can firmly plant your heels. Feeling properly dressed gives us confidence. You could spend plenty on impressive bodysuits, but functional clothing can be anything from cotton shorts and shirt to gardening gear, particularly if you exercise at home. Some like tight clothes, others prefer a looser fit. You do need to dress so that everything stays in place under vigorous challenge. Women benefit from a sports bra and men need to be suitably constrained in the groin area. Gyms have lots of levers, bars, chains, and pulleys. Flapping and dangling things can get caught. Avoid flapping and dangling things—clothes or body parts. While some gyms supply towels, many do not, and you need to bring your own. Using towels to minimize sweat from dripping everywhere and to keep equipment isolated from body fluids as much as possible is a fundamental hygiene principle that should not be taken lightly—although some guys seem to think they are beyond this. Any water bottle with a squirt lid will do, but make sure it has a firm screw top. Water bottle spills are not uncommon in gyms, and it's messy, particularly if a sticky sports drink is involved. Water is usually sufficient, but a sports drink may be useful if you plan an especially hard workout. If you exercise at home you need to be aware that distractions from kids or pets, friends or family can not only dilute your workout effort but possibly distract your concentration enough to make it dangerous. Dumbbells and barbells are heavy so take care. Benches can be fallen off of, fitness balls can be slipped from, and steps can be tripped over. Boisterous children may need supervision or exclusion. I see them regularly—Guys walking into the gym, heading straight for the weight room to start lifting. Many will get away with it without injury; some will not. You must warm up first. It gets the blood flowing, loosens joints, and generally gets muscles and joints mobile for when you hit them with some serious work. It has also been shown to improve performance and results. Try a 10- to 15-minute walk or jog on the treadmill and some modest stretching, although more serious stretching is best done after your workout. A light sweat is a good sign that you are ready to go for it. You don't want to rush your first session of weight training. You have a lot to absorb, whether you use a gym instructor, personal trainer, or you're just navigating it alone. Ideally, take a guided tour of the equipment before you begin. It makes your first session a lot easier. Those clunky machines with pulleys, the on/off buttons, and the ambiance of the weight room all tend to put some pressure on you to look as if you know it all. Yet most gym users remember screwing something up, so just ask and most people will help you out. Take your time, look around, watch what others do, and try things out. Stay cool. Now that you're ready, follow up with any of the other articles on weight training to see how the exercises are properly done.